There are so many types of shredders out these days. How in the world do you know which one to choose? Of course, the money factor plays a huge part as well as how much you will be using it. You may need something basic that will shred your junk mail or you may have the need for something with a little more gusto to shred piles of papers. If you have mounds and mounds of documents that need to be shredded, consider taking the boxes full of papers to a local store to be shredded. Office supply stores and UPS stores will often times provide an in-house shredding service. You’ll pay less than $1 per pound to have your secrets destroyed. Your favorite financial institution may even provide this service! I’ve even heard of many other businesses such as mortgage companies who have free shredding events for the public. Take a peak in your local newspaper or even Craigslist to see if there are any shredding events in your neighborhood. Your favorite, local Professional Organizer my even know of a few resources as well. Once you have the backlog of papers shredded and destroyed, I suggest finding a shredder that will help you maintain your office by shredding documents as you go. 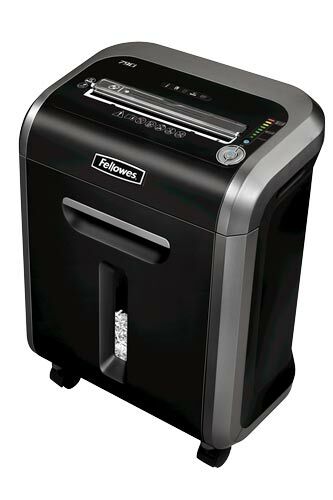 Recommended by more reviewers than any other shredder, the Fellowes PS-79Ci combines superb safety features with quiet operation, a 6-gallon pull-out waste bin and guaranteed jam-free performance. This model shreds CDs and DVDs as well as credit cards and documents secured with staples or paper clips. Safety features include a sensor that shuts off the shredder if a hand gets close to the slot. The shredder carries a two-year warranty. You can pick up one of these at Amazon.com for $179.00. If you don’t need to destroy CDs or shred a lot of paper at once, reviewers say this budget paper shredder is a good value. The 5-gallon bin doesn’t pull out; to empty it, you must lift off the top, which contains the motor, cutters and controls. This model also has an opening in the front of the bin for papers that need to be recycled but not shredded. Safety features include a patented sensor that shuts off the shredder if a hand gets close to the slot. The Fellowes DS-3 shreds staples and small paper clips as well as paper and credit cards, and carries a one-year warranty. 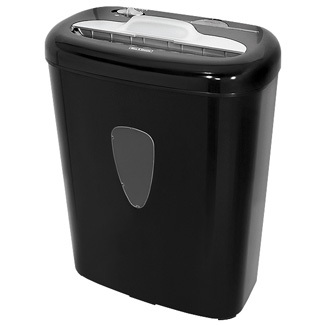 This shredder can be purchased for $75.00 at Amazon.com. This small, Aurora AS800CD Cross Cut Paper Shredder from Walmart can’t do anything fancy; the size of its crosscut shreds are larger than most, so it isn’t the most secure, plus it doesn’t have any remarkable safety features. Still, in more than 200 user reviews, owners are overwhelmingly happy with this simple shredder. With a bin size of about 3 gallons and a paper capacity of just six sheets (don’t try more than three sheets at a time to be on the safe side), it’s best for light duty. But in its price range, it gets much better reviews than competing paper shredders. Visit Walmart to pick up this shredder for $25.00.